There are three doors to a registered trademark. Whether you file on your own, or hire a trademark attorney, it’s helpful to understand the procedure used to evaluate the ways to file, and the procedures used by the Trademark Office to decide if your application will be approved. All roads lead to Rome. These three doors lead to a registered trademark. There are three questions and three doors. Answer yes to one of them, and follow the path through the appropriate doorway. Door No. 2: I’ve been selling products or services to the public. Door No. 3: I live outside the US and have a registered trademark or application in my home country. Regardless of which door you choose, your application will go through the same examination process explained below. The only difference is the initial requirements for entry through each door are slightly different. Additional documentation will be required behind two of the doors before you reach your goal to a registered trademark. 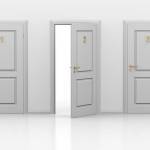 What’s behind the three doors to a registered trademark? Intent to Use. If you are a startup, or have developed a new product but have not yet started selling it, you can “reserve” your trademark before you sell your product or offer your services. This is the Intent to Use door. Instead of a registration, the successful applicant receives a “Notice of Allowance” that guarantees the right to register once you actually sell the products or offer the services. Then, you will be required to pay an additional fee and file acceptable samples of use before the registration can issue. When use can’t be proven within six months, procedures allow for at least 4 successive 6-month extension periods upon payment of the prescribed fee. Actual Use. Behind Door 2 lies the most direct path to registration. If your company has been selling a product or service to the public, then file the application with proof of use and go straight to registration. The key to this path is that the application must state the dates of first use, and include samples proving use that meet strict federal regulations. Section 44(a)(b). Section 44 of the trademark statute allows a foreign trademark owner or applicant to file in the US. Door # 3 is special for a couple of reasons. First, if the applicant chooses Door 3 within 6 months of filing in the home country, it is possible to obtain priority, and obtain the same date of filing in the US. This can be helpful to make certain no one files in the US before you to block your registration in the US. Second, no proof of use is required at all to obtain a US trademark registration once the foreign registration is issued. Copies of the foreign registration must be filed with the US. Read: Foreign Brand Owner’s Guide to US Trademark Registration. Each trademark application is assigned to an attorney in the Trademark Office. With 4-6 months after filling, the Examining Attorney reviews the application to determine whether it meets the legal requirements. An important key to successful trademark registration is filing the initial application correctly. This includes knowing what and how to file, namely based upon a strategy that maximizes the chances of success. This typically requires significant experience, since if the application is filed incorrectly, some errors cannot be corrected. The application will be lost. Formalities that must be met include claims of ownership, the category of goods or services, the description of goods or services, the manner of use, and whether the samples of use are acceptable. If filing defects are present, the application will be rejected. Read: 5 Reasons Your Trademark Application will be Rejected. The Trademark Examiner will evaluate whether the proposed trademark is distinctive and not descriptive. This is by far the biggest problem for new brand owners seeking to register a trademark. A mark that describes the goods or services, or even a quality or ingredient of the goods or services cannot be registered. Read: 5 Choices for a Trademark and Two of them are Bad. 87% of all US trademark applications receive an initial rejection, called an Office Action. Next, the examiner reviews pending and existing federal registrations to see if there is an earlier filed application, or existing registrations that are confusingly similar. Other marks need not be identical in order to cause yours to be rejected. In fact most are not and may include a common word, prefix or other element, or be registered for non-identical, but related goods. The latter can be quite complex and usually require an experienced attorney to respond. The majority of all applications receive a first rejection, called an Office Action. An Office Action must be answered within six months or the application will be abandoned. Once approved, the application is “published” publicly for opposition and any other brand owner, or any one who feels they could be damaged, can file an opposition to prevent your registration. If no one opposes within 30 days, approval of the registration will issue, or the Notice of Allowance will issue. Congratulations, once you enter by one of three doors to a registered trademark, and pass the examination process you are on your way. Trademarks are a valuable business asset. Make certain to maintain your trademarks and use them correctly. Go forth and become a well-known brand.